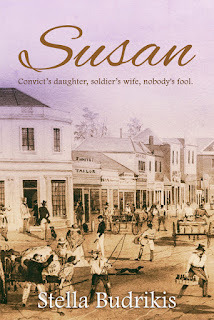 Susan: Convict’s daughter, soldier’s wife, nobody’s fool is the true story of Susan Whybrew (nee Mason). Susan was born in 1848 in Adelaide, South Australia, to Irish parents. She survived childhood destitution, the hardships of being an “off the strength” army wife and giving birth to fourteen children, all with a feisty spirit that refused to accept insults from anyone. In telling Susan’s story, the author captures something of what life was like for those close to the bottom of the social ladder in the Victorian era, both in Australia and in Britain. The book is similar in genre to The Tin Ticket by Deborah Swiss. Susan is available as an ebook for Kindle, Apple and other ebook readers, and as a paperback from Amazon. Read the introduction and first two chapters for free by clicking on the book cover image. The story of Susan is well written, and is based on extensive research, for which the author should be congratulated. She has included a detailed record of the references used, which provides a valuable resource for anyone doing their own family research. This is a recommended read for anyone interested in Irish migration in the nineteenth century, and for all with an interest in the history of Australia. It is one woman’s history that provides a view of life for the less privileged at that time. Ozzie Reader (Amazon reviewer).